April 21, 2018. 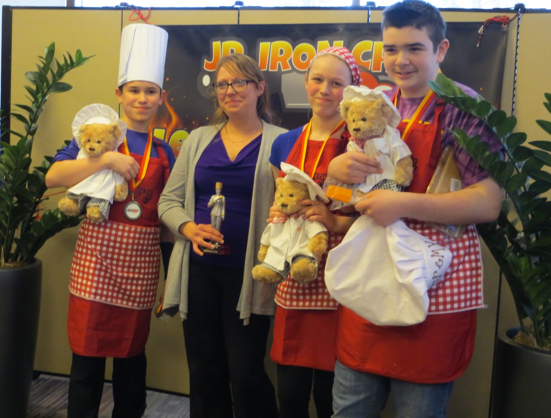 The competition is a contest for Middle and High School students where teams compete within divisions in their school district to create and develop winning recipes. Contest rules include the use of two or more locally sourced foods, and two or more USDA (commodity) foods that school cafeterias are required to use. The competition provides our children an opportunity to learn about and build lifelong skills related to healthy food purchasing and preparation and gives them a voice in what is served in their school cafeteria. We invited all the schools from nine counties, eight of which were represented by participants. For the Middle School morning session we had 15 teams, and in the afternoon High School session, we had 10 teams: a total of 92 student chefs to tempt the palates of 12 judges. 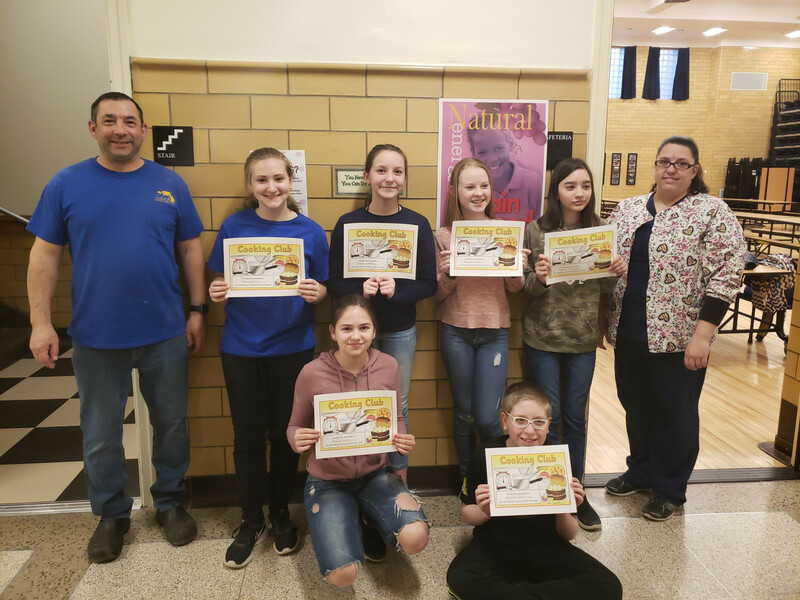 Winning recipes this year included Vegetable Lasagna, by team Jr. Cook On from Waterville CSD and BBQ Pulled Veggies on Cornbread topped with Rainbow Citrus Coleslaw from team French Toast Mafia from Margaretville CSD. My experience with cooking club was absolutely amazing. The kids we had in the club were 7th to 12th grade. The kids learned all about sanitation, knife skills, safety and cleanliness besides the food. Some cooking skills taught were sautéing, baking, broiling. It was more than cooking, it involved working together as a team, getting along and having fun.Cooking was a great way to educate them about good nutrition, what's in season, planning, meal prep and reading food labels. Additionally, it is a way to encourage healthy eating among the students. My goals for next year is to teach more about nutrition, label reading, planning meals, and creativity. The cooking club was a great eye-opening experience for me. I realized that children do not get enough time in the kitchen. We are always in a hurry to go to school functions such as practice whether it is for a play or for a sport and games. Parents work late hours so when they get home they do not want to make something from scratch let along a big meal. As a result, children do not get to learn from their parents how to use a knife or how to mix ingredients in a bowl. Our cooking workshop is geared for students to learn the fundamentals of cooking. How to hold and use a knife and kitchen equipment properly. How to read a recipe. How to substitute ingredients to make it healthier. or to make it taste better. We touched on nutrition such as why it is healthier to make recipes from scratch then from a box. Our goal for next year's cooking workshop is to teach a great deal on nutrition. The importance and benefits of eating healthier. Different ways you can cook vegetables to make them taste great. How to plan a menu for the whole week on a budget and still make it health and delicious. The Living Well program was established to improve patient outcomes as well as patient engagement at rural clinics sites. Preliminary outcome and process data is encouraging. Participants express that the workshop serves as a "wake up call to take control of your health, of your diabetes", they've "learned to read food labels, felt comfortable asking questions, and learned to do and accomplish an action plan", as well as "accomplish things one step at a time"! The workshops not only benefit the participant, but our peer leaders enjoy their work too. Jane Keane, Living Well Recruiter and Peer Leader captured the essence of why we do this work, "when participants succeed and show improvements in their health, I'm motivated to share this program with even more people in our community." Our first cycle of Living Well with Diabetes included eight workshops, and 80 diabetic participants. Of these 63 (79%) completed the workshop. Preliminary results show improvement in A1C values for those participants that completed the program. Among completers, clinical data indicates pre/post percentage of A1c levels at or above 8% went from 47% to 25%. These early successes have led to expansion of the Living Well program. Living Well with Diabetes is currently underway in 12 communities throughout the region, and plans are taking shape for 13 Living Well with Chronic Disease workshops and 7 Chronic Pain workshops that will take place this fall. 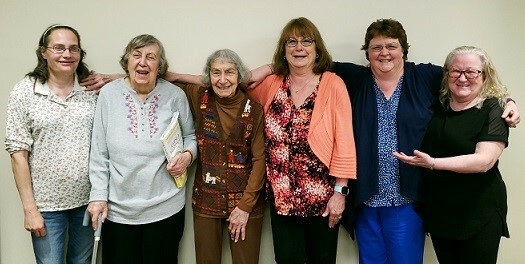 This work would not be possible without our partners: RHENSOM, Madison County Rural Health Council, Madison County Office for the Aging, Chenango Health Network, Schoharie County Office for the Aging, Herkimer HealthNet, RHNSCNY, and numerous community sights that have hosted our workshops. Meet Katelyn Tessier who started working with RHENSOM on April 30th 2018 as a member of the Living Well Program. Katelyn has been working at Bassett since November 2013 as a scheduler for the Bassett Cancer Institute. In 2015, Katelyn transitioned into the role of clinical trials research assistant, where she handled the regulatory aspects of multiple different trials, managed the institutions Tumor Board meetings, and assisted with maintaining the database for the Lung Cancer Screening program. Now part of the Living Well Program, Katelyn will be working on data entry and becoming a program facilitator for the Living well workshops. Outside of work, Katelyn enjoys spending time with her husband and daughter at their home in Cobleskill. In her free time, she enjoys being outdoors, practicing archery, and reading a good book. Please join us on welcoming Katelyn to the Bassett Research team. On March 22nd our annually School Nurse Symposium was held at SUNY Cobleskill campus sponsored by RHENSOM and co-sponsored by the Zone 7 Region of the New York State Association of school Nurses. The speakers of the night included Cindy Campbell, FNP-BC, a family nurse practitioner within the school based health system who shared best practices for exclusion and return to school including treatments for common infectious diseases in schools. Our keynote speaker, Melanye Rockwell, RN, BSN from the Zone 7 Region of the New York State Association of school Nurses whose presentation was for and to Empower school nurses for a job well done day in and out of school. In attendance were three community agencies tabling at the event who shared resources with school nurses that were present. The agencies that were represented were: Catholic Charities of Delaware, Otsego, and Schoharie Counties by Amy Pricolo-Brown and Angela Smith, Catskill Center for Independence by Jason Paden, and Rehabilitation Support Services (RSS) by Stacy Briggs. RHENSOM staff appreciate all who attended and participated in this event. For those who did not attend, please reach out to Winnie Atim to learn more about the event and topics discussed that day. 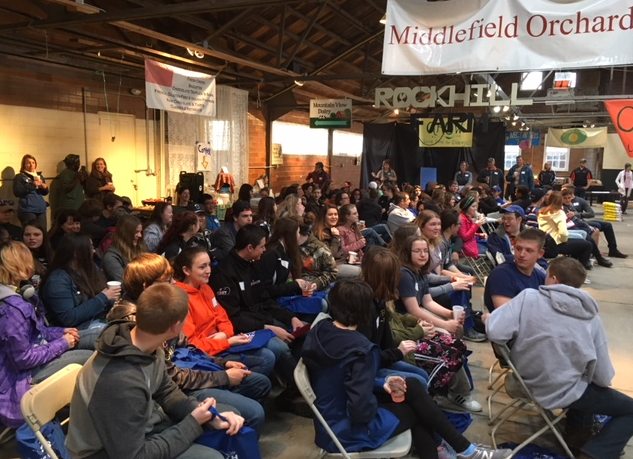 Approximately 100 area high-schoolers, representing eight schools and five counties, gathered Friday April 27th in Cooperstown Farmers market to contemplate the future of food. The inaugural Youth Food Movement Summit was presented by the Otsego County chapter of Youth Food Movement, together with Origins Cafe and Bassett Health Care Network. The Otsego County chapter of Youth Food Movement started by Kristen and Dana Leonard of Origins Café brought about the bigger picture of the Youth Food Movement that could involve other students from different school districts. Students participated in three stations, learning about agroecology, culinary leadership and social media, as well as the impact of foods on their health and environment. Teams then continued to make a "disco soup" from unused or "ugly" produce. This was served as lunch and the vegetables that the students cut were later sold by donation at Cooperstown Farmers Market on Saturday by Origins. Money from donations goes towards support stipends stipends and creation of a greenhouse/ school garden at the Cooperstown High school. Every year RHENSOM recognizes and honors districts in Schoharie, Otsego or Montgomery counties who are leaders in school wellness, are fully committed to improve their wellness programming, or have demonstrated growth in developing their wellness program over the previous year. In the 2017-2018 school year, three schools were acknowledged: Greater Amsterdam school district (School Garden), Cherry Valley-Springfield central school district (Lunch room materials to foster a healthy eating habit among students and facility), and Greater Plains Elementary school in the Oneonta City School District (install a water bottle filling station). These three schools embodied Excellence in School Wellness over the previous years and are continuing to do so. RHENSOM is looking for schools that have or are in the process of developing ongoing policies, practices and activities that support a culture of wellness and can have a lasting impact on the entire school community. Sustainability: Demonstrate that your current and future projects and programming are long lasting. Impact: How do your current and future projects reach as many students, staff, parents/guardians as possible? Achievement Award: Currently meets all five award criteria and has sustainable and high-impact programming. Vision Award: Currently meets at least four award criteria, with a plan in place to improve and enhance wellness. Growth Award: Currently meets at least three award criteria and district is able to demonstrate significant growth in the area of school wellness initiatives. 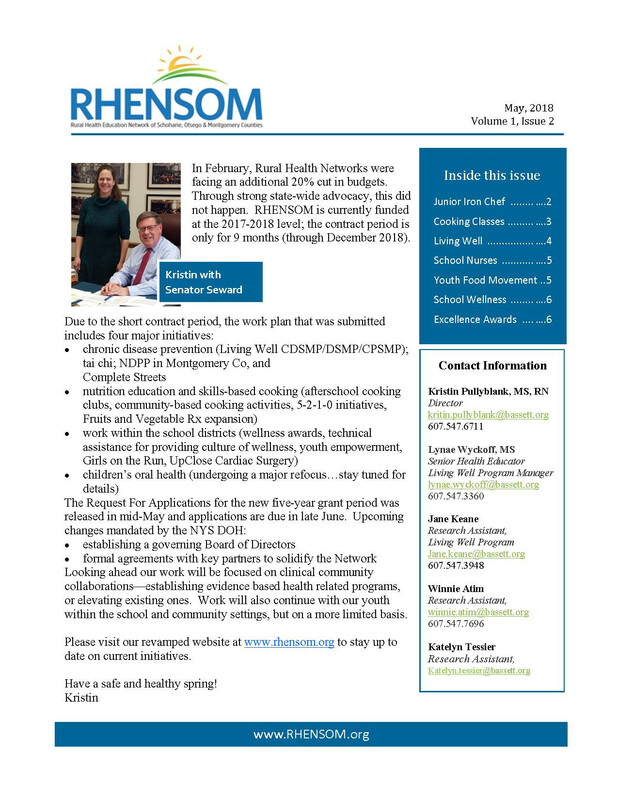 The Rural Health Education Network of Schoharie, Otsego and Montgomery Counties, funded by the New York State Office of Rural Health, and a program of the Bassett Healthcare Network, is offering the Excellence in School Wellness Awards for the 2018-2019 school year. The purpose of these awards is to recognize and honor districts in Schoharie, Otsego or Montgomery counties who are leaders in school wellness, are fully committed to improve their wellness programming, or have demonstrated growth in developing their wellness program over the previous year.